Hey guys! I wanted to review a product that I've had for a while and have been generally happy with, but never got around to sharing it with you for a full blog review until now. 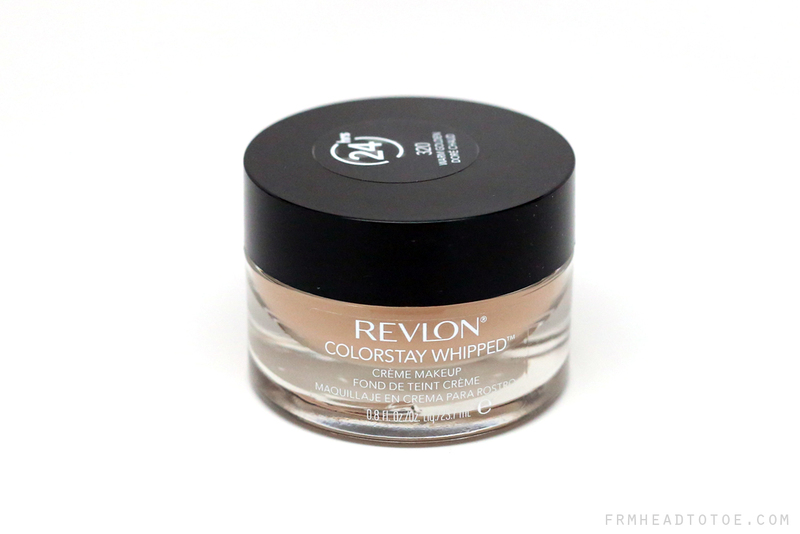 It's been some time since I've done a foundation review and I've been on bit of a drugstore foundation kick lately so I thought it would be perfect timing to share with you my thoughts on Revlon's Colorstay Whipped crème makeup. Check it out below! The product comes in a large, weighty glass container carrying 0.8 fluid ounces with an open pot design. It's not the greatest in terms of hygiene since it requires re-dipping fingers/brushes so it's very important to wash hands right before application each time. Overall I still think it looks quite classy for being around $12 at Target. The texture in the pot itself is an almost springy/fluffy cream which looks liquid but feels more like a mousse-hybrid product. If I turn the pot upside down it doesn't come dripping out so there's a definite density to it. One great thing about it is it's quite foundation-newbie friendly since you literally take a bit on your fingertips and blend it into the skin where you need it and it doesn't require expert blending skills to look nice. The color I purchased is 320 Warm Golden which is the closest match on my NC30 skintone although as you can see here it does lean slightly pinker than my skin. My face tends to be pinker than my arm, but it is fair warning for ladies who are very yellow-toned that it may not work for you. You can see with the heavy swatch that it can get very good high coverage but the thickness of the foundation makes it prone to looking cakey when too much is applied. 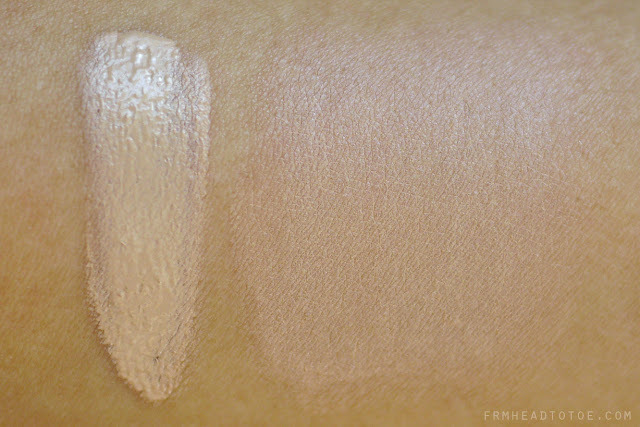 The coverage is actually medium-to-full with a light swatch as well so I recommend starting with less than you think you need and building up only in areas that need more coverage. I have dark acne hyperpigmentation and I can get away with skipping concealer and powder with this foundation so it's wonderful for lazy days or for students, and is actually really awesome for those with oily skin even though it's a "cream" foundation formula. I also find that it looks way better after an hour post-application since it settles into the skin and looks very natural. This natural look lasts throughout the day without looking patchy or breaking down. One very notable downside to this product is that it doesn't look great in film or photography and gives me an obvious white cast. I wore this foundation in my Hyuna Gangnam Style tutorial so you can see what I mean. It actually looks much nicer in real life though, especially after the "settling" period I mentioned earlier! Overall, I think this is a nice, affordable option for those who love the texture of cream concealers but want the all-over coverage of a foundation. Most of you new to foundation should be pretty happy trying this out for the first time, but foundation experts who are on camera often may want a higher-end pick for important face time. 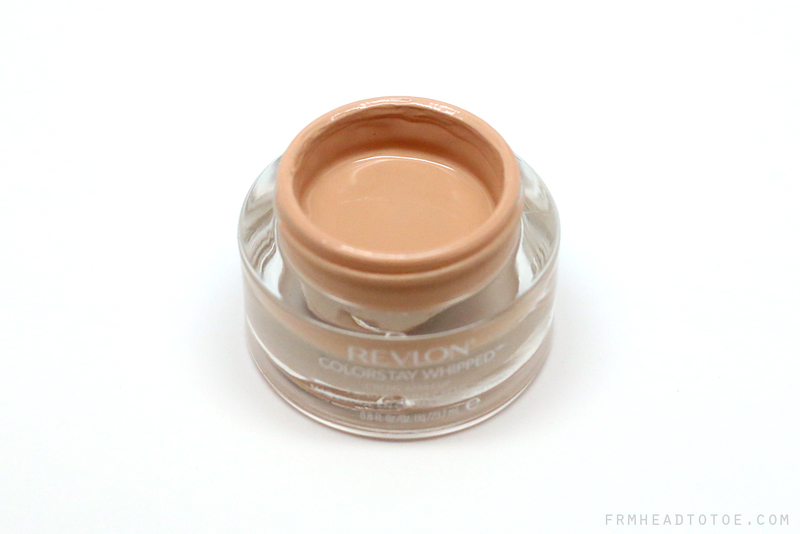 Readers, have you tried Revlon Colorstay Whipped Foundation? What is your favorite drugstore foundation? Let me know in the comments! Great review Jen! I bought this foundation a while ago when it first came out and thought I would love it.. but ended up I didn't because I felt it was too thick. :( So I returned it. It was unfortunate. Enter to win Dr. Hauschka Regenerating Eye Cream! Hi, I'm Mieza :) how do you apply this foundation ? finger/brush/sponge ? I find this foundation goes on best with fingers! Brushes and sponges may make it go on too heavily since it's a cream foundation. I found it looking cakey as well! Maybe because my skin is super dry so it makes it look even more cakey :( I thought I was the only one because everyone seemed to only have good things to say about it. No, you definitely aren't the only one. I've read some reviews from girls with dry skin and this foundation didn't work very well for them! Thanks for the review! I think I'll stick to my Missha BB cream for now. I do not like change when it comes to foundation! I totally understand what you mean when you say this foundation looks better an hour later. I bought mines in Sand Beige and I look like I have a white cast on my skin after I put it on. But an hour later, it looks flawlessly amazing on my skin. Glad to know you felt the same way! It's so weird, this is the only foundation that does this in my opinion! I wasn't thrilled with it as a foundation but I found it to be a nice concealer under my Skin 79 BB cream. Obviously too bulky to be a travel concealer but it does the job for quick on the go days. I really like this foundation and i like that it's housed in a pretty jar :D You look great! Thank you for this great review! I always watch your YouTube . Your make-up skill is sooo amazing! I want you to give me some advice . I'm a Japanese 18-year-old girl. I am going to be an university student from this April! So I want to have fundamental make-up stuffs like brushes, eye shadows, liners, foundations and so on. But in Japan ,because high school students mustn't make up,I have no experience . Please tell me what to buy for the first time. Of course if you can. Maybe easy ones are good for me. I am an Asian and have monolids like CL of 2ne1. I'm sure it's different for those in different countries, but a basic concealer/light foundation/bb cream is important as a base layer. Then, I would experiment with drugstore eyeliner and mascara. A 4-color neutral eyeshadow palette is a great next step, then a peachy pink blush you can wear everyday can give a healthier complexion. Finally, try a natural pink lipstick or lipgloss for everyday use! I've read and watch several reviews about this foundation. I am tempted to buy this, since I like full coverage foundation because I also have dark acne marks plus the horrible oiliness on my t-zone. But there's one thing that bother me, just like what you've mentioned this will not look good with yellow skintone, which I have :( And some said that this one oxidize, have you experienced the same thing Jen? Oh by the way, have you tried the Revlon Colorstay Liquid Foundation? If yes, which do you think is better between the two? Or if you haven't tried it, please make a review! Thanks! Nice picture! I also love this foundation! I hesitated for a really long time before buying it but I'm glad I did. The coverage is awesome and I agree, if you use too much it might be cakey. Hey Jen I found that after a while, and in comparison to my other foundations, that this had a weird smell to it. Have you come across it as well? I just took a whiff of mine and it has a slightly plastic/play dough smell but it's not too offensive and I don't notice it when I apply the foundation. I'll keep that in mind though! I have been using this one for about a month or so and I like it! I have the same skin tone as you. My skin is dry and I find that I don't have to powder it either. One way I've been keeping it a little more sanitary is by using Q-tips to grab what foundation I need- this way, my fingers stay out of the pot. One could also use a makeup spatula and wash it to reuse for less waste. Great review! I don't think this has been released in the UK yet but it's something I definately want to try out! Ooo great review! I will definitely try this one. I have combination skin and my T-zone tends to get really oily, despite using oil control powders or sprays. Even the pink BB cream gives me an oily sheen at the end of the day and mineral make up makes my pores look large. But if this foundation looks better as the day goes on I'm sold! Great review! I think it was spot on and I totally agree. There are a lot of things I like about the foundation, but it's not one of my favorites. I also think it leans a tad pink, and doesn't really do great things on my skin. It does feel nice when putting it on(I also prefer using my fingers), but I don't know...I've been underwhelmed. I first loved this foundation too, but as you pointed out, for yellow-tone skin tones it comes out too pink. Why can't Revlon make anything yellow based?! I love the wear and coverage but in the end it made me too pink and, as you also pointed out, created a white reflective cast when photographed. Out of drugstore foundations I find Maybelline and L'Oreal (same company) foundations work with my yellow-based skin tone. Also, Maybelline Dream Mousse foundation is a good alternative; it's similar in coverage and wear as Revlon ColorStay Mousse but in a pump dispenser with yellow shade offerings. Ooh, I'm intrigued! I'll have to look into that one! Which shade do you use for the L'Oreal and Maybelline Dream Mousse? I'm curious b/c I have a hard time finding foundation that is more yellow based too. I bought this in the next shade to the shade you bought and i regret because it was too red and dark for my skin! i should of bought golden tan! but then this product broke me out with cystic acne. i really love the texture and everything about it though. I'm jealous that it suits your skin! it looks great on you! what are you wearing on your lips? I was wearing a bit of Urban Decay Super Saturated lip color in Crush just in the center of the lips. It's VERY fluorescent hot pink in person! Hi Jen! Wondering if you've trIed any shu uemura foundations or Face Shop primers/foundation, would love to read reviews on them! I haven't tried either! Since Shu Uemura and Face shop aren't in the US it may be harder for me to get those products to review but I will if I get the chance! I was wondering how I would go about choosing the right shade for me since it's a drugstore brand and there are no makeup artists or samples available in the store? I'm slightly darker than you, Jen, with more yellow undertones. Thanks! I love your blog. The best advice I can give is to do some research online and see if you can find reviews from girls with your same skin color. For reference, I am MAC foundation shade NC30 (sometimes a touch lighter) so you are probably NC30-NC35. A lot of bloggers will use MAC shades to compare skin colors and products so if you look up by that you should find some helpful recommendations! For cream/liquid items that come in a pot, I try to use a mini spatula to prevent contamination of the product. I was wondering if you have any recommendations on foundations that won't leave a white cast while being photographed and that will still matte on oily skin? Thanks a bunch! Thanks for your thoughts on this foundation. I've been wanting to try it as well since I've heard some much about it on YouTube. Since you say it leaves a white cast during photography, what foundation would you recommend instead? Reason I'm asking is because I want to get a foundation for my upcoming wedding in May. I've been wanting to buy this but not quite sure yet to buy. My still no 1 fave drugstore foundation is Revlon ColorStay for Oily/combo skin! I've been hearing so many good reviews about this foundation it's kind of hard to stay away. But I don't know, I get kind of freaked out at the fact that this comes in a tub. I'm more of a pump person. If you guys want any more advice on choosing a good foundation, check out http://www.beauty.ps/tool/foundation. I actually really like this foundation! I typically just use pressed powder, but I wanted something that would provide a little more coverage on those days my skin needs a little more help. This foundation looks really nice. It feels a little heavy and sticky at first, but after setting it with some powder and waiting about 10 minutes, I couldn't feel it on my face anymore. I do find the packaging a little misleading, I feel like the price is more for the heavy glass than the product itself. But the good think about a jar is you can scoop out every last bit :). Hi Jen, have to tried revlon photoready foundation or the colorstay liquid foundation? Hi i currently wear max factor foundation in golden and really want to purchase this revlon foundation. Do they sell it in the UK i cannot find it anywhere??... Also what shade would you recommend for me.. I think i am either warm golden or medium beige..... Thanks!! Hi, I'm Jen! I've been blogging and making youtube videos since 2008 and have loved encouraging others to feel beautiful in their own skin ever since. I hope you enjoy my beauty tips and reviews, style inspiration, and a bit of my life as a wife and mother! TAG: I Heart Drugstore Makeup! Manicure Monday: OPI Liquid Sand "Stay The Night"